Nonspecific, firm, tender subcutaneous nodules without livedo reticularis and/or systemic involvement may be the first sign of polyarteritis nodosa (PAN). See Cutaneous Clues to Accurately Diagnosing Rheumatologic Disease, a Critical Images slideshow, to help recognize cutaneous manifestations of rheumatologic diseases. 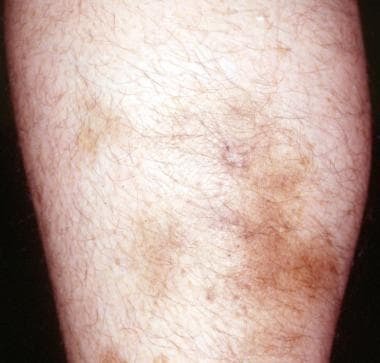 Also see the slideshow Vasculitis: Case Presentations for more information on clinical, histologic, and radiographic imaging findings in various forms of vasculitis. For information on pediatric PAN, see Childhood Polyarteritis Nodosa. The understanding of vasculitides continued to increase by the 1980s with the discovery of antineutrophil cytoplasmic antibodies (ANCAs). Microscopic polyangiitis (MPA; formerly called microscopic polyarteritis) is an ANCA-associated systemic vasculitis that has some features similar to those of classic PAN, with the additional involvement of renal glomeruli and pulmonary capillaries. In the chronic stage, fibrinoid necrosis of the vessels causes thrombosis and tissue infarction. Aneurysmal dilatations of the involved arteries, as large as 1 cm in size, are characteristic findings of PAN. Kidney lesions show predominant arteritis without glomerulonephritis; however, in patients with severe hypertension, glomerulosclerosis may be superimposed with glomerulonephritis. Pulmonary arteries are not involved, and bronchial artery involvement is uncommon. Polyarteritis nodosa (PAN) spares large vessels (the aorta and its major branches), the smallest vessels (capillaries and small arterioles), and the venous system. Vascular lesions affect medium-sized muscular arteries and occur mainly at bifurcations and branch points. Controversy has surrounded the potential association of hepatitis C virus (HCV) with PAN. HCV may be linked to cutaneous PAN, a benign, limited form of PAN. In a study of 16 patients with cutaneous PAN, 5 tested positive for hepatitis C.  HCV-associated PAN has also been described in 31 patients included in a larger 161 patient cohort with HCV-related vasculitis in France. Despite the presence of serum cryoglobulins, these patients were diagnosed with HCV-PAN on the basis of typical histopathologic features of PAN and/or the presence of microaneurysms and/or multiple stenoses on abdominal and/or renal angiography. A number of other infectious organisms have been reported in association with PAN or PAN-like diseases, but causal evidence is inconsistent. These organisms include varicella-zoster virus, parvovirus B-19, cytomegalovirus, human T-cell leukemia virus, streptococcal species, Klebsiella species, Pseudomonas species, Yersinia species, Toxoplasma gondii, Rickettsiae, trichinosis, and sarcosporidiosis. [20, 21] Recently, reports of associations with PAN and human immunodeficiency virus  and cutaneous PAN and tuberculosis  have been published as well. Some syndromes, including rheumatic diseases, malignancies, and infections have been associated with clinical syndromes indistinguishable from idiopathic PAN. Rheumatoid arthritis (RA) and Sjögren syndrome have been associated with PAN. Notably, the incidence of RA-associated vasculitis has decreased greatly since the 1980s, likely attributable to improvements in the management of RA. Cutaneous PAN occurring with HLA-B39 spondyloarthritis,  common variable immunodeficiency,  and psoriatic arthritis in an 11-year-old boy  have also been reported. The prognosis is markedly worse in patients with acute abdominal syndromes characterized by extensive bowel involvement. Multiple perforations may be found, relapses are common, and the postoperative course is complicated by infections and delayed healing. Surgery performed for cholecystitis or appendicitis does not appear to worsen prognosis in the same way. Permanent morbidity due to PAN is relatively rare, although patients may develop peripheral neuropathy, renal insufficiency or renal failure, and/or hypertension. Fever, weight loss, and malaise are present in 50% of patients; renal failure and hypertension, in 60%; arthritis, arthralgia, and myalgia, in 64%; and peripheral neuropathy and mononeuritis multiplex, in 51%. When left untreated, the 5-year survival rate of PAN is 13%. Nearly half of patients die within the first 3 months of onset. Corticosteroid treatment improves the 5-year survival rate to 50-60%. When the steroid is combined with other immunosuppressants, the 5-year survival rate may increase to greater than 80%. Death associated with PAN occurs as a result of uncontrolled vasculitis, infectious complications related to treatment-induced immunosuppression, and vascular complications of the disease, such as myocardial infarction and stroke. The mortality rate is higher in patients with acute abdominal syndromes. Intractable hypertension contributes to morbidity and mortality rates. When the FFS is zero, the predicted mortality rate at 5 years is 11.9%. When the FFS is 1, the mortality rate is 25.9%, and when the FFS is 2 or more, the mortality rate is 45.9%. Stanton M, Bhimji SS. Polyarteritis Nodosa. 2018 Jan. [Medline]. [Full Text]. Ozen S. The changing face of polyarteritis nodosa and necrotizing vasculitis. Nat Rev Rheumatol. 2017 Jun. 13 (6):381-386. [Medline]. Kussmaul A, Maier R. Ueber eine bisher nicht beschriebene eigenthümliche Arterienerkrankung (Periarteritis nodosa), die mit Morbus Brightii und rapid fortschreitender allgemeiner Muskellähmung einhergeht. Dtsch Arch Klin Med. 1866. 1:484-518. Forbess L, Bannykh S. Polyarteritis nodosa. Rheum Dis Clin North Am. 2015. 41 (1):33-46, vii. [Medline]. Matteson EL. A history of early investigation in polyarteritis nodosa. Arthritis Care Res. 1999 Aug. 12(4):294-302. [Medline]. Davson J, Ball J, Platt R. The kidney in periarteritis nodosa. Q J Med. 1948 Jul. 17(67):175-202. [Medline]. Stone JH. Polyarteritis nodosa. JAMA. 2002 Oct 2. 288(13):1632-9. [Medline]. Lightfoot RW Jr, Michel BA, Bloch DA, Hunder GG, Zvaifler NJ, McShane DJ. The American College of Rheumatology 1990 criteria for the classification of polyarteritis nodosa. Arthritis Rheum. 1990 Aug. 33(8):1088-93. [Medline]. Jennette JC, Falk RJ, Andrassy K. Nomenclature of systemic vasculitides. Proposal of an international consensus conference. Arthritis Rheum. 1994 Feb. 37(2):187-92. [Medline]. Colmegna I, Maldonado-Cocco JA. Polyarteritis nodosa revisited. Curr Rheumatol Rep. 2005 Aug. 7(4):288-96. [Medline]. Trepo C, Guillevin L. Polyarteritis nodosa and extrahepatic manifestations of HBV infection: the case against autoimmune intervention in pathogenesis. J Autoimmun. 2001 May. 16(3):269-74. [Medline]. Mahr A, Guillevin L, Poissonnet M, Aymé S. Prevalences of polyarteritis nodosa, microscopic polyangiitis, Wegener's granulomatosis, and Churg-Strauss syndrome in a French urban multiethnic population in 2000: a capture-recapture estimate. Arthritis Rheum. 2004 Feb 15. 51(1):92-9. [Medline]. Guillevin L, Lhote F, Cohen P, Sauvaget F, Jarrousse B, Lortholary O, et al. Polyarteritis nodosa related to hepatitis B virus. A prospective study with long-term observation of 41 patients. Medicine (Baltimore). 1995 Sep. 74(5):238-53. [Medline]. Zhou Q, Yang D, Ombrello AK, Zavialov AV, Toro C, et al. Early-onset stroke and vasculopathy associated with mutations in ADA2. N Engl J Med. 2014 Mar 6. 370 (10):911-20. [Medline]. Navon Elkan P, Pierce SB, Segel R, Walsh T, Barash J, et al. Mutant adenosine deaminase 2 in a polyarteritis nodosa vasculopathy. N Engl J Med. 2014 Mar 6. 370 (10):921-31. [Medline]. [Full Text]. Gonzalez Santiago TM, Zavialov A, Saarela J, Seppanen M, Reed AM, Abraham RS, et al. Dermatologic Features of ADA2 Deficiency in Cutaneous Polyarteritis Nodosa. JAMA Dermatol. 2015 Nov 1. 151 (11):1230-4. [Medline]. Caorsi R, Penco F, Grossi A, Insalaco A, Omenetti A, et al. ADA2 deficiency (DADA2) as an unrecognised cause of early onset polyarteritis nodosa and stroke: a multicentre national study. Ann Rheum Dis. 2017 May 18. [Medline]. Soufir N, Descamps V, Crickx B. Hepatitis C virus infection in cutaneous polyarteritis nodosa: a retrospective study of 16 cases. Arch Dermatol. 1999 Aug. 135(8):1001-2. [Medline]. Saadoun D, Terrier B, Semoun O, Sene D, Maisonobe T, Musset L, et al. Hepatitis C virus-associated polyarteritis nodosa. Arthritis Care Res (Hoboken). 2010 Oct 27. [Medline]. Hughes LB, Bridges SL Jr. Polyarteritis nodosa and microscopic polyangiitis: etiologic and diagnostic considerations. Curr Rheumatol Rep. 2002 Feb. 4(1):75-82. [Medline]. Somer T, Finegold SM. Vasculitides associated with infections, immunization, and antimicrobial drugs. Clin Infect Dis. 1995 Apr. 20(4):1010-36. [Medline]. Patel N, Patel N, Khan T, Patel N, Espinoza LR. HIV infection and clinical spectrum of associated vasculitides. Curr Rheumatol Rep. 2011 Dec. 13(6):506-12. [Medline]. Imanishi H, Tsuruta D, Oshimo T, Sowa J, Mizuno N, Nakagawa K, et al. Cutaneous polyarteritis nodosa induced by Mycobacterium tuberculosis. J Dermatol. 2012 Aug. 39(8):738-9. [Medline]. Watts RA, Mooney J, Lane SE, Scott DG. Rheumatoid vasculitis: becoming extinct?. Rheumatology (Oxford). 2004 Jul. 43(7):920-3. [Medline]. Nakano H, Ooka S, Shibata T, Ogawa H, Ito H, Takakuwa Y, et al. Cutaneous polyarteritis nodosa associated with HLA-B39-positive undifferentiated spondyloarthritis in a Japanese patient. Mod Rheumatol. 2012 Sep. 22(5):783-6. [Medline]. Pagnini I, Simonini G, Lippi F, Azzari C, Cimaz R. Cutaneous polyarteritis nodosa and common variable immunodeficiency: a previously unreported association. Clin Exp Rheumatol. 2012 Jan-Feb. 30(1 Suppl 70):S169. [Medline]. Oulego-Erroz I, Gautreaux-Minaya S, Martinez-Sáenz de Jubera J, Naranjo-Vivas D, Fernéndez-Hernández S, Muñíz-Fontán M. Coexistence of polyarteritis nodosa and psoriatic arthritis in a child: an unreported association: Polyarteritis nodosa and Psoriatic arthitritis. Eur J Pediatr. 2011 Sep. 170(9):1213-5. [Medline]. Hasler P, Kistler H, Gerber H. Vasculitides in hairy cell leukemia. Semin Arthritis Rheum. 1995 Oct. 25(2):134-42. [Medline]. Ambrosio MR, Rocca BJ, Ginori A, Onorati M, Fabbri A, Carmellini M, et al. Renal infarction due to polyarteritis nodosa in a patient with angioimmunoblastic T-cell lymphoma: a case report and a brief review of the literature. Diagn Pathol. 2012 May 8. 7:50. [Medline]. [Full Text]. McMahon BJ, Heyward WL, Templin DW, Clement D, Lanier AP. Hepatitis B-associated polyarteritis nodosa in Alaskan Eskimos: clinical and epidemiologic features and long-term follow-up. Hepatology. 1989 Jan. 9(1):97-101. [Medline]. Selga D, Mohammad A, Sturfelt G, Segelmark M. Polyarteritis nodosa when applying the Chapel Hill nomenclature--a descriptive study on ten patients. Rheumatology (Oxford). 2006 Oct. 45(10):1276-81. [Medline]. Levine SM, Hellmann DB, Stone JH. Gastrointestinal involvement in polyarteritis nodosa (1986-2000): presentation and outcomes in 24 patients. Am J Med. 2002 Apr 1. 112(5):386-91. [Medline]. Kato A, Hamada T, Miyake T, Morizane S, Hirai Y, Yamasaki O, et al. Clinical and Laboratory Markers Associated With Relapse in Cutaneous Polyarteritis Nodosa. JAMA Dermatol. 2018 Aug 1. 154 (8):922-926. [Medline]. Falcini F, La Torre F, Vittadello F, Rigante D, Martini G, Corona F, et al. Clinical overview and outcome in a cohort of children with polyarteritis nodosa. Clin Exp Rheumatol. 2014 May-Jun. 32(3 Suppl 82):S134-7. [Medline]. Eleftheriou D, Dillon MJ, Tullus K, Marks SD, Pilkington CA, Roebuck DJ, et al. Systemic polyarteritis nodosa in the young: a single-center experience over thirty-two years. Arthritis Rheum. 2013 Sep. 65(9):2476-85. [Medline]. Mahmood-Rao H, Ding T, Gandhi N. Gangrenous digital infarcts in a severe case of cutaneous polyarteritis nodosa. BMJ Case Rep. 2017 Jun 29. 2017:[Medline]. Agarwal A, Bansal M, Pandey R, Swaminathan S. Bilateral subcapsular and perinephric hemorrhage as the initial presentation of polyarteritis nodosa. Intern Med. 2012. 51(9):1073-6. [Medline]. Battula N, Tsapralis D, Morgan M, Mirza D. Spontaneous liver haemorrhage and haemobilia as initial presentation of undiagnosed polyarteritis nodosa. Ann R Coll Surg Engl. 2012 May. 94(4):e163-5. [Medline]. Parent BA, Cho SW, Buck DG, Nalesnik MA, Gamblin TC. Spontaneous rupture of hepatic artery aneurysm associated with polyarteritis nodosa. Am Surg. 2010 Dec. 76(12):1416-9. [Medline]. Yuce M, Davutoglu V, Sari I, Onat AM. Polyarteritis nodosa with multiple coronary aneurysms presenting as acute myocardial infarction. Am J Med Sci. 2011 May. 341(5):409. [Medline]. Pagnoux C, Le Guern V, Goffinet F, Diot E, Limal N, Pannier E, et al. Pregnancies in systemic necrotizing vasculitides: report on 12 women and their 20 pregnancies. Rheumatology (Oxford). 2011 May. 50(5):953-61. [Medline]. Kocyigit I, Koyuncu S, Mavili E, Unal A, Tokmak TT, Cilan H. Unusual clinic presentation of polyarteritis nodosa: involvement of axillary and brachial artery. Ren Fail. 2011. 33(10):1043-5. [Medline]. Guillevin L, Lhote F, Gayraud M, Cohen P, Jarrousse B, Lortholary O. Prognostic factors in polyarteritis nodosa and Churg-Strauss syndrome. A prospective study in 342 patients. Medicine (Baltimore). 1996 Jan. 75(1):17-28. [Medline]. Fernandes SR, Coimbra IB, Costallat LT. Uncommon features of polyarteritis nodosa: psychosis and angio-oedema. Clin Rheumatol. 1998. 17(4):353-6. [Medline]. Griffin JW. Vasculitic neuropathies. Rheum Dis Clin North Am. 2001 Nov. 27(4):751-60, vi. [Medline]. Rosenberg MR, Parshley M, Gibson S, Wernick R. Central nervous system polyarteritis nodosa. West J Med. 1990 Nov. 153(5):553-6. [Medline]. [Full Text]. Haroon M, Bermingham N, Keohane C, Harney S. Polyarteritis nodosa presenting with clinical and radiologic features suggestive of polymyositis. Rheumatol Int. 2012 Apr. 32(4):1079-81. [Medline]. Yang SN, Cho NS, Choi HS, Choi SJ, Yoon ES, Kim DH. Muscular polyarteritis nodosa. J Clin Rheumatol. 2012 Aug. 18(5):249-52. [Medline]. Filippone EJ, Foy A, Galanis T, Pokuah M, Newman E, Lallas CD. Segmental arterial mediolysis: report of 2 cases and review of the literature. Am J Kidney Dis. 2011 Dec. 58(6):981-7. [Medline]. Kermani TA, Ham EK, Camilleri MJ, Warrington KJ. Polyarteritis nodosa-like vasculitis in association with minocycline use: a single-center case series. Semin Arthritis Rheum. 2012 Oct. 42(2):213-21. [Medline]. Bezier M, Perceau G, Reguiai Z, Remy-Leroux V, Tchen T, Durlach A. [Necrotic leg ulcers induced by vitamin K antagonists: five cases]. Ann Dermatol Venereol. 2011 Oct. 138(10):657-63. [Medline]. Higuchi T, Sugimoto N, Hayama M, Tanaka E. The usefulness of 3D-CT angiography in polyarteritis nodosa. Intern Med. 2012. 51(11):1449-50. [Medline]. Özçakar ZB, Fitöz S, Yıldız AE, Yalçınkaya F. Childhood polyarteritis nodosa: diagnosis with non-invasive imaging techniques. Clin Rheumatol. 2017 Jan. 36 (1):165-171. [Medline]. Ricotti C, Kowalczyk JP, Ghersi M, Nousari CH. The diagnostic yield of histopathologic sampling techniques in PAN-associated cutaneous ulcers. Arch Dermatol. 2007 Oct. 143(10):1334-6. [Medline]. Gheita TA, Khairy NA, Nasrallah MM, Hussein H. Subclinical renal involvement in essential cryoglobulinemic vasculitis and classic polyarteritis nodosa. Joint Bone Spine. 2012 May. 79(3):274-80. [Medline]. Demirkaya E, Ozen S, Pistorio A, Galasso R, Ravelli A, Hasija R. Performance of Birmingham Vasculitis Activity Score and disease extent index in childhood vasculitides. Clin Exp Rheumatol. 2012 Jan-Feb. 30(1 Suppl 70):S162-8. [Medline]. Campanilho-Marques R, Ramos F, Canhão H, Fonseca JE. Remission induced by infliximab in a childhood polyarteritis nodosa refractory to conventional immunosuppression and rituximab. Joint Bone Spine. 2014 May. 81 (3):277-8. [Medline]. Matsuo S, Hayashi K, Morimoto E, Kato A, Sada KE, Watanabe H, et al. The Successful Treatment of Refractory Polyarteritis Nodosa Using Infliximab. Intern Med. 2017. 56 (11):1435-1438. [Medline]. [Full Text]. Inoue N, Shimizu M, Mizuta M, Ikawa Y, Yachie A. Refractory cutaneous polyarteritis nodosa: Successful treatment with etanercept. Pediatr Int. 2017 Jun. 59 (6):751-752. [Medline]. Krusche M, Ruffer N, Kötter I. Tocilizumab treatment in refractory polyarteritis nodosa: a case report and review of the literature. Rheumatol Int. 2018 Nov 21. [Medline]. Seri Y, Shoda H, Hanata N, Nagafuchi Y, Sumitomo S, Fujio K, et al. A case of refractory polyarteritis nodosa successfully treated with rituximab. Mod Rheumatol. 2015 Mar 12. 1-3. [Medline]. de Luna G, et al; French Vasculitis Study Group (FVSG). Plasma exchanges for the treatment of severe systemic necrotizing vasculitides in clinical daily practice: Data from the French Vasculitis Study Group. J Autoimmun. 2015 Dec. 65:49-55. [Medline]. Frohnert PP, Sheps SG. Long-term follow-up study of periarteritis nodosa. Am J Med. 1967 Jul. 43(1):8-14. [Medline]. Gayraud M, Guillevin L, le Toumelin P, Cohen P, Lhote F, Casassus P. Long-term followup of polyarteritis nodosa, microscopic polyangiitis, and Churg-Strauss syndrome: analysis of four prospective trials including 278 patients. Arthritis Rheum. 2001 Mar. 44(3):666-75. [Medline]. Guillevin L, Mahr A, Cohen P, Larroche C, Queyrel V, Loustaud-Ratti V, et al. Short-term corticosteroids then lamivudine and plasma exchanges to treat hepatitis B virus-related polyarteritis nodosa. Arthritis Rheum. 2004 Jun 15. 51(3):482-7. [Medline]. Guillevin L, Lhote F, Leon A, Fauvelle F, Vivitski L, Trepo C. Treatment of polyarteritis nodosa related to hepatitis B virus with short term steroid therapy associated with antiviral agents and plasma exchanges. A prospective trial in 33 patients. J Rheumatol. 1993 Feb. 20(2):289-98. [Medline]. Guillevin L, Lhote F, Sauvaget F, Deblois P, Rossi F, Levallois D. Treatment of polyarteritis nodosa related to hepatitis B virus with interferon-alpha and plasma exchanges. Ann Rheum Dis. 1994 May. 53(5):334-7. [Medline]. Erhardt A, Sagir A, Guillevin L, Neuen-Jacob E, Häussinger D. Successful treatment of hepatitis B virus associated polyarteritis nodosa with a combination of prednisolone, alpha-interferon and lamivudine. J Hepatol. 2000 Oct. 33(4):677-83. [Medline]. Wicki J, Olivieri J, Pizzolato G, Sarasin F, Guillevin L, Dayer JM. Successful treatment of polyarteritis nodosa related to hepatitis B virus with a combination of lamivudine and interferon alpha. Rheumatology (Oxford). 1999 Feb. 38(2):183-5. [Medline]. Molloy PJ, Friedlander L, Van Thiel DH. Combined interferon, famciclovir and GM-CSF treatment of HBV infection in an individual with periarteritis nodosa. Hepatogastroenterology. 1999 Jul-Aug. 46(28):2529-31. [Medline]. de Menthon M, Mahr A. Treating polyarteritis nodosa: current state of the art. Clin Exp Rheumatol. 2011 Jan-Feb. 29(1 Suppl 64):S110-6. [Medline]. Fernanda F, Serena C, Giustina R, Antonella B, Alessandra D, Alessio M. Mycophenolate mofetil treatment in two children with severe polyarteritis nodosa refractory to immunosuppressant drugs. Rheumatol Int. 2012 Jul. 32(7):2215-9. [Medline]. Berlit P. Diagnosis and treatment of cerebral vasculitis. Ther Adv Neurol Disord. 2010 Jan. 3(1):29-42. [Medline]. [Full Text]. Kawakami T, Soma Y. Use of mizoribine in two patients with recalcitrant cutaneous polyarteritis nodosa. J Am Acad Dermatol. 2011 Jun. 64(6):1213-4. [Medline]. Kluger N, Guillot B, Bessis D. Ulcerative cutaneous polyarteritis nodosa treated with mycophenolate mofetil and pentoxifylline. J Dermatolog Treat. 2011 Jun. 22(3):175-7. [Medline]. Tender, hyperpigmented, firm subcutaneous nodules with a background of livedo reticularis common in cutaneous polyarteritis nodosa (PAN). Tender erythematous nodules with central "punched out" ulcerations common in cutaneous polyarteritis nodosa (PAN). Polyarteritis nodosa (PAN) is characterized by fibrinoid necrosis of the arterial wall with a leukocytic infiltrate. In this slide, a large, pale occlusion of a muscular artery can be seen. Within this collagenous tissue is a leukocytic infiltrate, which is the hallmark of PAN. Courtesy of Urbana Atlas of Pathology. Livedo reticularis in polyarteritis nodosa (PAN).